COBB Tuning 3-Port Boost Control Solenoid - Pann Auto Performance - San Diego largest aftermarket automotive performance parts - What do you drive? 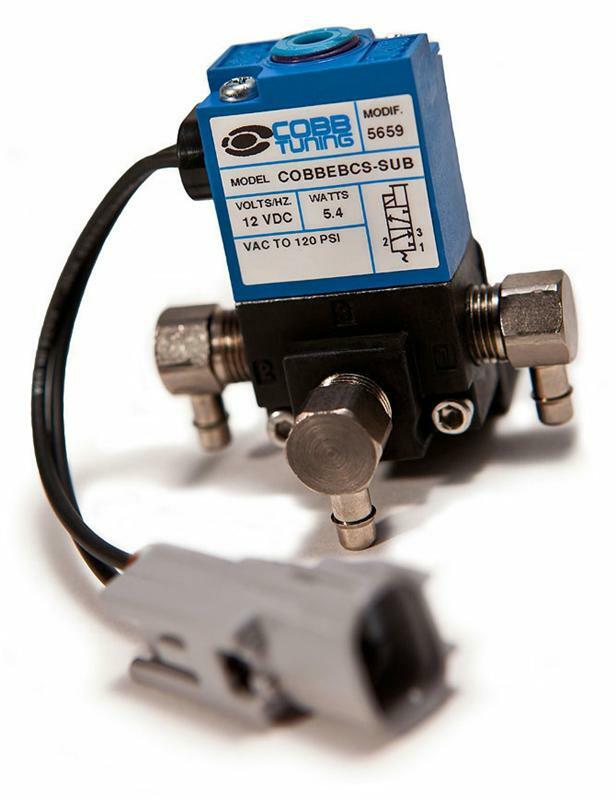 COBB Tuning is proud to announce the immediate availability of the COBB Tuning 3-Port Boost Control Solenoid (BCS) for turbocharged Subaru, Mazda and Mitsubishi applications. The COBB 3-Port Boost Solenoid is an excellent upgrade for modern turbocharged vehicles, enabling precise boost control in a tidy package that is easy to install and tune. Our BCS will eliminate boost fluctuations and boost creep inherent in OEM boost control systems, providing the necessary stable and repeatable boost control required for accurate tuning and consistent performance. The COBB BCS is equally capable of providing stable boost control at stock boost levels as well as extremely high boost levels associated with big-power builds, with an operating range of up to 120psi. The COBB Tuning 3-Port BCS features 1/8” low-profile barb fittings to keep the unit compact, and are nickel coated for corrosion resistance. Optional 1/4” nickel plated fittings are also available separately. Viton spools and seals are used throughout for long life and lubricated with Dow Corning silicone grease. The manual override port is sealed with an O-ring, the wiring harness is sealed to the casing using a waterproof grommet and the solenoid wires are ultrasonically welded to the coil, making the device waterproof and safe to wash.
COBB Tuning has made the COBB 3-Port BCS installation as simple as possible. It mounts in the stock location and plugs directly into the stock wiring harness, making the physical install and electrical connection as straightforward possible. The BCS comes with a custom aluminum mounting bracket, stainless steel hardware, the necessary boost-line to complete all connections and zip-ties to route the boost-line neatly through the engine bay. The install instructions are easy to understand, with photographs and illustrations to guide you through the installation process, and include routing instructions for both internal and external wastegate configurations. The COBB Tuning 3-Port BCS is the ultimate electronic boost control device for modern turbocharged applications, designed with outstanding boost control, engineered for consistent performance over an extended service life, and configured for easy installation. Get your boost under control and Access the Potential of your turbocharged Subaru, Mazda or Mitsubishi today!